Note that the gaps in enrollment can be visualized by gender, location and household wealth. The area of the circle is proportional to the size of the gap (i.e. the bigger the circle, the higher the enrolment gap) with wealth gap being the difference in enrolment between individuals in the top and bottom wealth terciles. For information on how we define these variables and descriptors, please find our data dictionary here. Percentage of individuals enrolled in formal education (beginning grade 1) by age at start of school year. The line graphs are presented by country site and cohort. School year in India and Peru typically starts in April while school year in Ethiopia and Vietnam typically starts in September. Young Lives Younger Cohort children born in 2001/02 present in all rounds of the survey. Young Lives Older Cohort children born in 1994/95 present in all rounds of the survey. 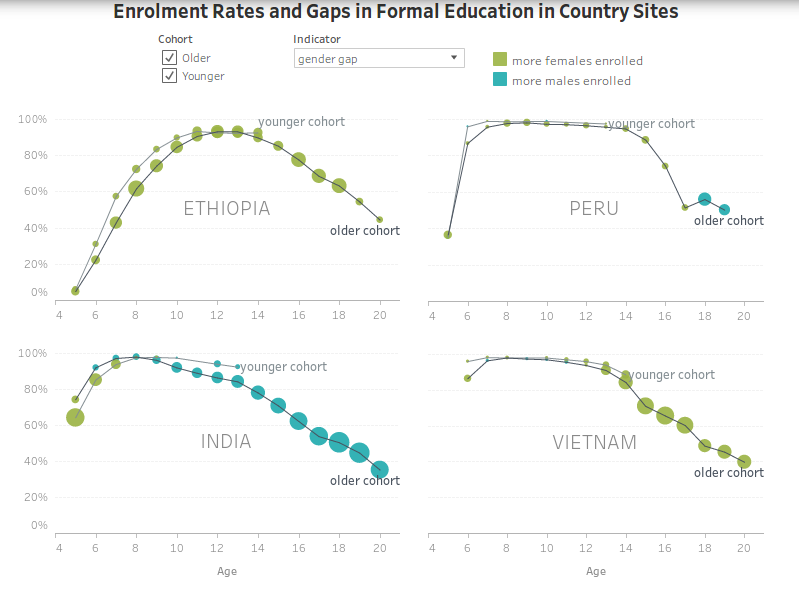 Absolute difference in enrolment rates between males and females. Absolute difference in enrolment rates between individuals living in urban and rural areas in round 1 (2002) survey. Absolute difference in enrolment rates between individuals in the top and bottom wealth tercile computed using the Young Lives Wealth Index. Household's wealth in round 1 (2002) survey computed using the Young Lives Wealth Index disaggregated into terciles (top, middle, bottom). The Young Lives Wealth Index is a composite index measuring households' access to services such as water and sanitation, their ownership of consumer durables such as refrigerators, and the quality of floor, roof, and wall materials in their dwelling. Households in each cohort of the Young Lives survey were categorised into terciles based on their wealth index in 2002, with the households with lowest wealth belonging to the bottom tercile, and those with the highest wealth belonging to the top tercile.